Don’t freak-out it’s no harder than cooking a brisket. When I was involved with RUB BBQ in New York City we had a reporter from the New York times, in to try our pastrami. We had just pulled 5 pastrami out of the smoker about an hour before she arrives, sliced her some. She took one bite, put it down and called her office and said “you need to get a photographer over here and take a picture of this pastrami it’s better than Katz’s.” That my friends; is high praise, since Katz’s considered the best Pastrami there is! Great St. Patrick's Day recipe. OPTIONAL: Soak the corned beef in a pot of water in the refrigerator overnight, make sure the beef is submerged completely. This pulls some of the salt cure out of the brisket. Set-up your Lang cooker to 250º degrees F.
Drain the corned beef and pat dry with paper towels, let come to room temperature. Combine the rub and mustard slather ingredients and set aside. Lay the corned beef fat side down and lightly paint the meat side and the sides with the slather using a pastry brush, sprinkle on the rub. Turn the meat over and repeat the process. Place it on your Lang and cook until the internal temperature is 195º to 205º degrees F. Approximately 8-10 hours. Remove the pastrami, tent with foil and let it rest for at least 30 minutes. Spread 1 tablespoon of the dressing on one piece of bread and top with half of the cheese, half of the sauerkraut, and all of the meat. Spread another tablespoon of the dressing over the meat and top with the remaining sauerkraut and cheese, in that order. Spread the remaining tablespoon of dressing on the remaining piece of bread and place it on top of the cheese, dressing side down. Press firmly to close the sandwich, then evenly spread the butter on the outside of the sandwich. Heat a heavy-bottomed frying pan over medium heat, place the sandwich in the pan, and press down on the sandwich with a spatula. (Alternatively, you can cook the sandwich in a sandwich press.) Cook until the bread is crisp and golden brown, about 4 minutes. Flip and cook until the second side is golden brown, the cheese is melted, and the sandwich is warmed through, about 4 minutes more. You can also serve your pastrami with grilled or boiled cabbage, and some good grainy mustard. 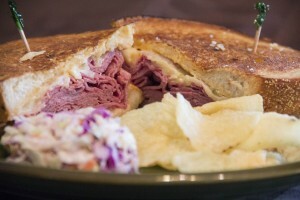 This entry was posted in Meat and tagged corned beef, Reuben sandwich, smoked pastrami recipe by . Bookmark the permalink.